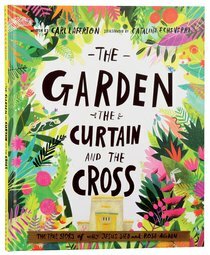 About "The Garden, Curtain and the Cross (Tales That Tell The Truth Series)"
Customer Reviews For "The Garden, Curtain and the Cross (Tales That Tell The Truth Series)"
This book has had me in tears! Easy enough for little ones to understand, but containing precious truth for all ages! The illustrations are incredible too. Nice book for children. The poetic text and beautiful illustrations are a great combination. This is a fantastic book that my kids love me to read again and again. They love it because of the clever rhymes, the engaging pictures and the repetition. I love it because it is such a clear explanation of the gospel at their level. The pictures are so well thought out and detailed, I feel like they notice new things each time we read it! And one of my personal favourite images, is that the "serpent" in the garden of Eden actually has legs when he is talking to Eve, before the curse. I love this because God curses the serpent to crawl on his belly in the dust his whole life, which means snakes probably did have legs before the curse! Most children's books do not have this much attention to detail. Buy this book! It explains beautifully the message of the bible. Starting from creation, our sin, God's desire to restore our relationship with Him, Jesus, his death and resurrection and how we can now live with God forever when we accept Jesus's invitation. Perfect for young children ages 3 and above I would think. Beautiful illustrations and simply worded. You wont regret buying this book! Highly recommend. Great books for kids that adults will love too! This book is so well done. The message of the whole bible is is told in a clear and expressive way. The text works perfectly with the colourful, humorous and clever illustrations. Its a great book for kids that adults will love too. This boldly illustrated journey from the garden of Eden to God's heavenly throne room shows how people from all ethnic and social backgrounds are valuable to God.